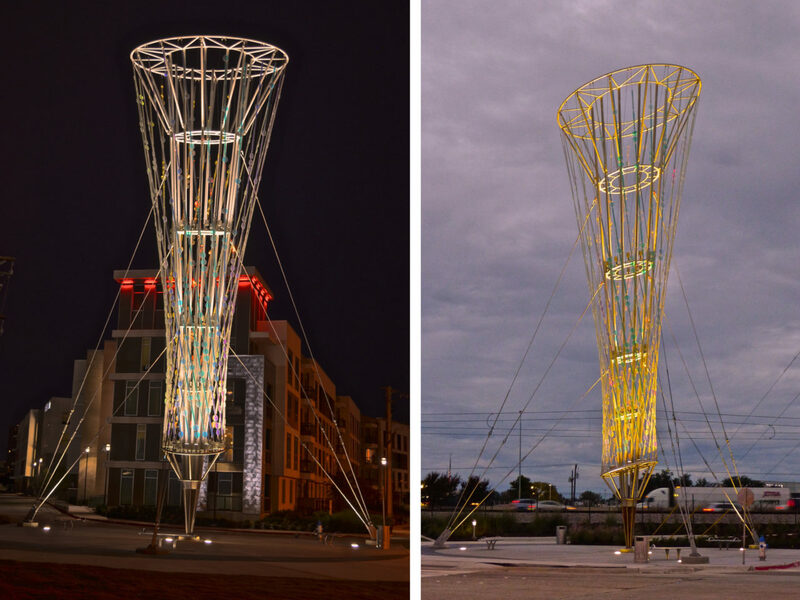 Ed Carpenter’s Eastside Public Art sculpture is titled “Micro Macro Mojo”, suggesting ambiguity of scale and purpose and magical power. 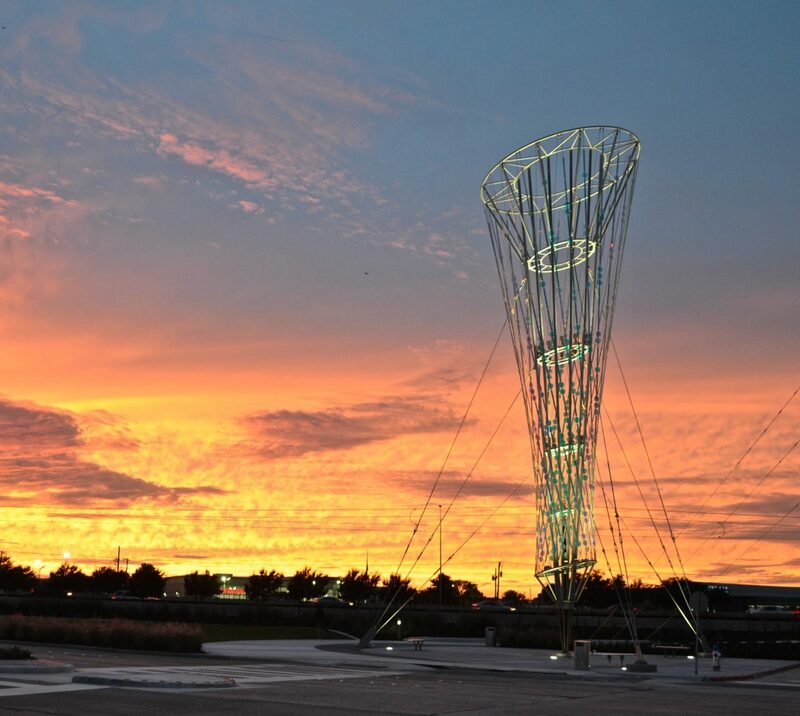 The 70’ high structure is like a torch, or lantern, or an enormous map pin marking the point of entry into Richardson. Its upward reaching gesture is optimistic and expansive, and its stainless steel and laminated glass are refined and contemporary. 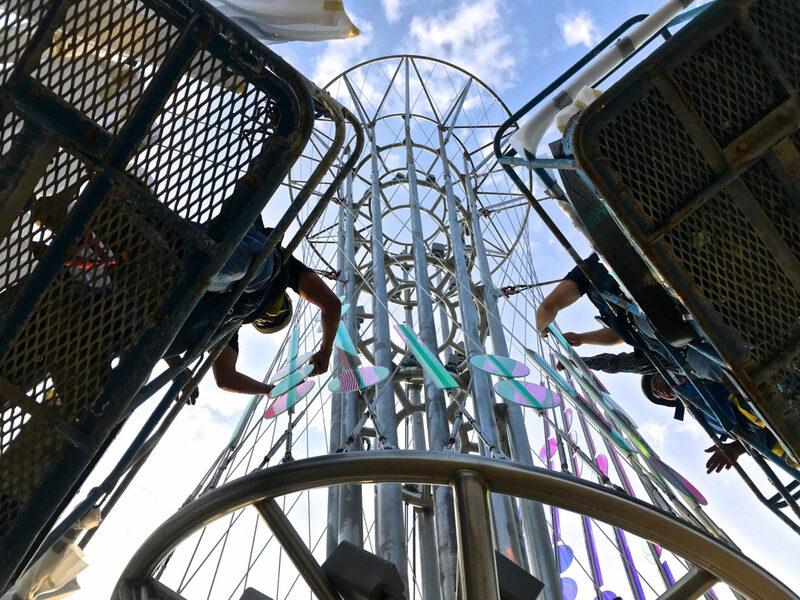 Tapering from 24’ across at the top to just 8” wide at the base, the dramatic artwork appears balanced like a ballet dancer on one toe. 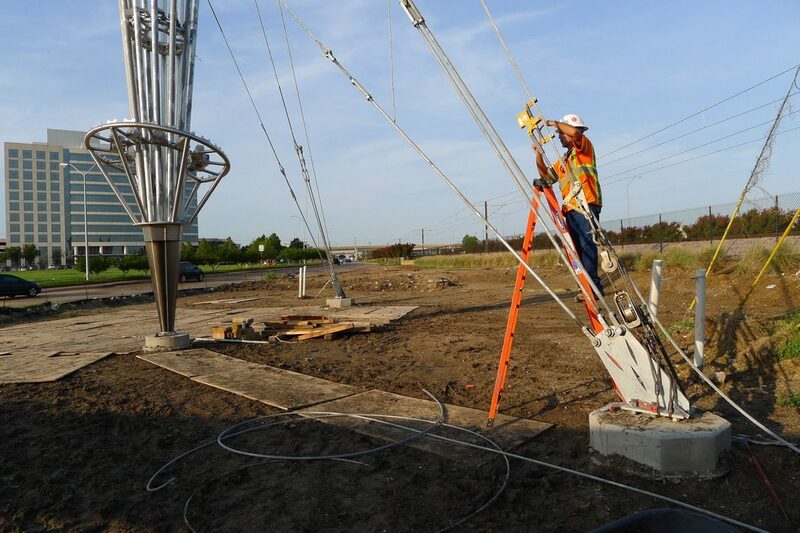 However, nine steel cables, engineered for the strongest winds, keep the sculpture perfectly vertical. 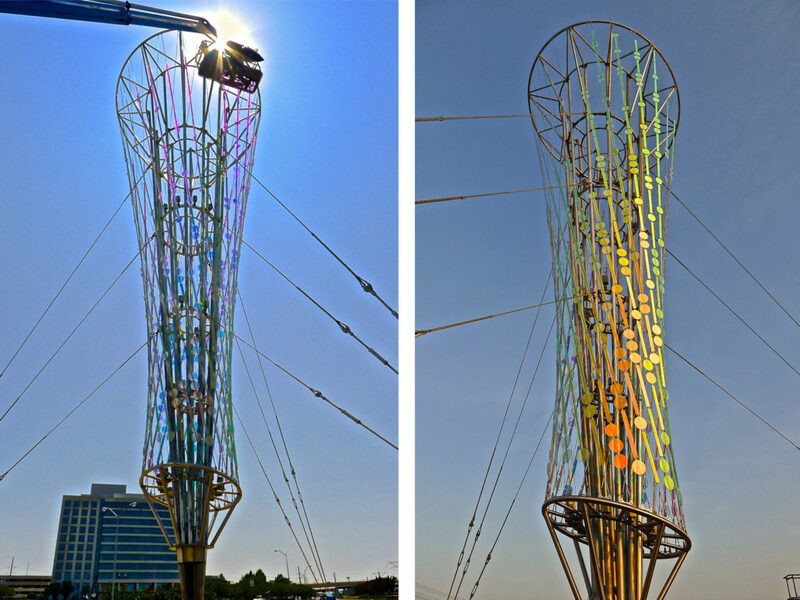 The sculpture contains an outer lattice layer of crossing diagonal cables spanning from the top to a point 11’ above ground. 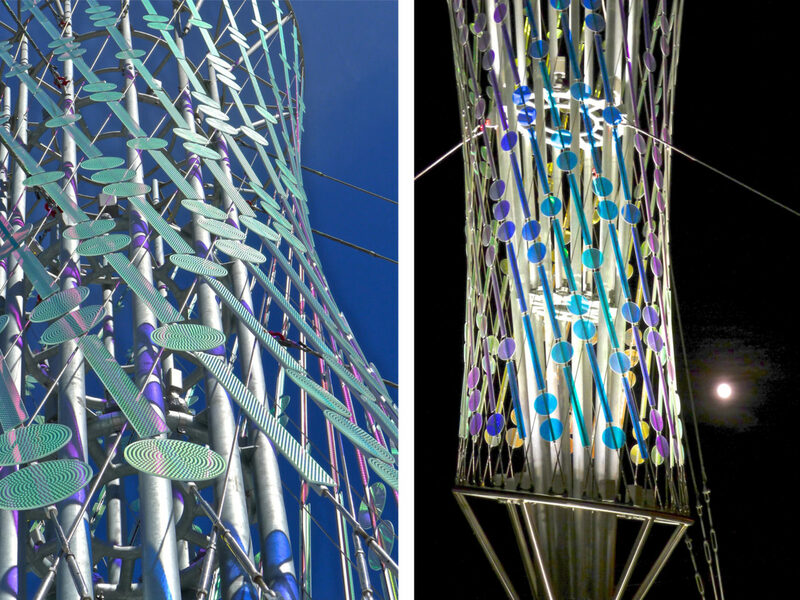 This network supports myriad laminated dichroic glass elements forming a rich texture of light-interactive surfaces. These elements may suggest abstract ones and zeros, the basic building blocks of all things digital, and fitting for a city with such a distinctly high-tech identity. They are made from laminated dichroic safety glass, secured with an engineered attachment system. Dichroic glass is a mercurially attractive material that responds to slight changes of light or angle of viewing, producing intriguing blushes of color—especially true in this case because of the curvature of the sculpture. Visitors who approach the structure and view it from different angles will be rewarded with a great variety of different looks in the glass. 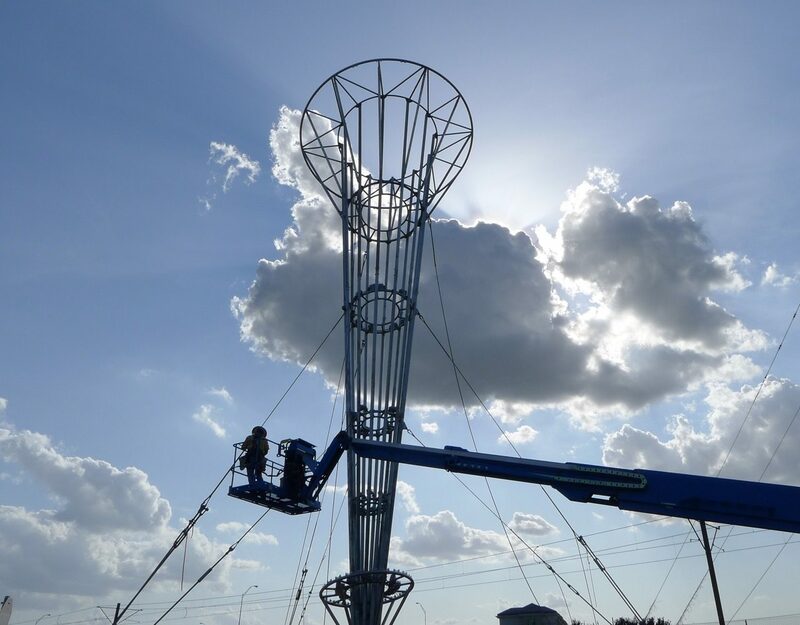 The large scale of the sculpture—possible within the budget primarily because of the cable-stayed structural system—is essential in such a visually complex environment. 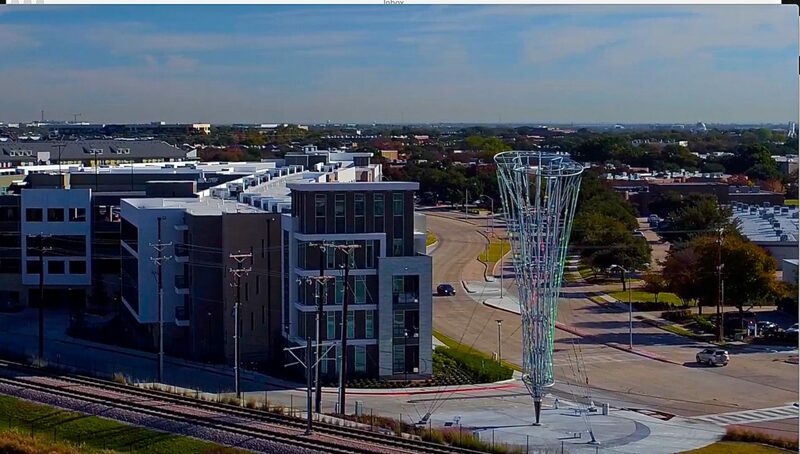 At 70’ high, it reaches well into the view of passing automobile and train travelers, providing maximum impact as a gateway and icon. At the same time, it provides a centerpiece for an attractive new pocket park. 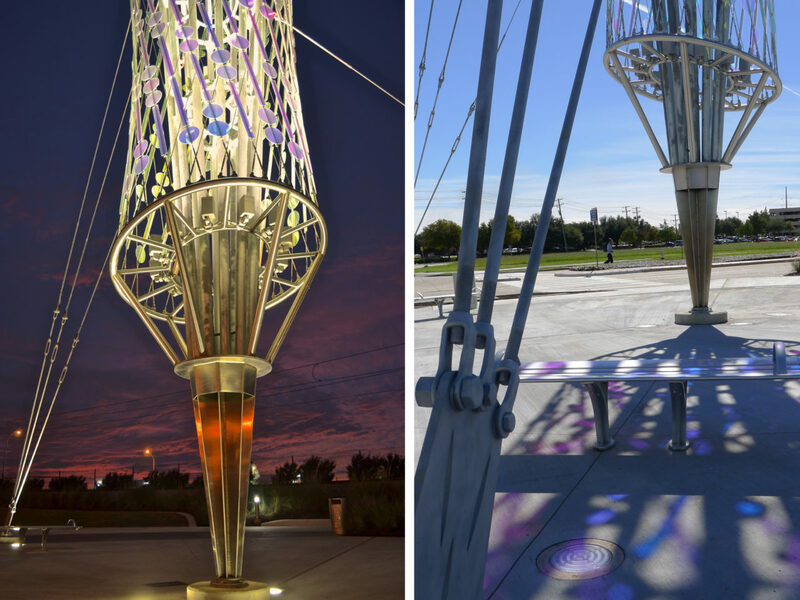 Materials: Stainless steel base and cables and hardware, laminated dichroic safety glass, galvanized carbon steel main structure, galvanized steel structural cables and hardware. 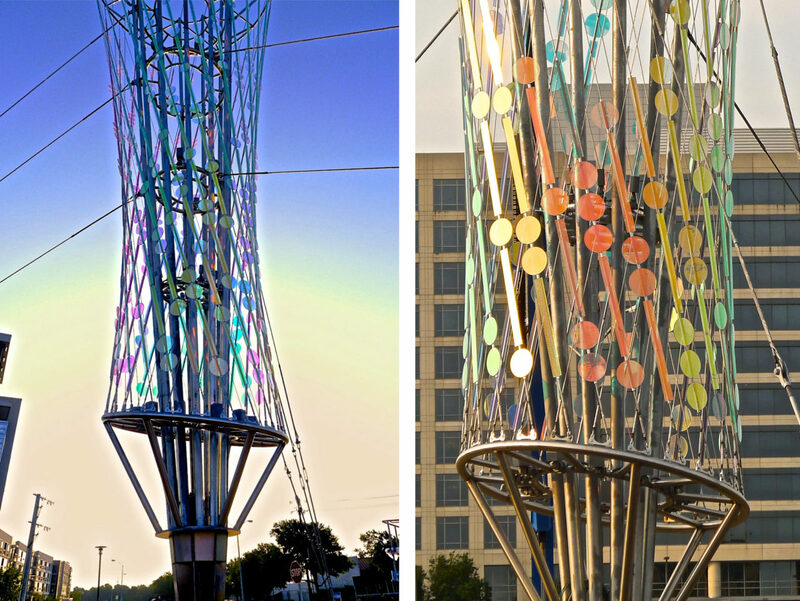 Descriptors: Sculpture, site specific sculpture, gateway, architectural gateway, exterior sculpture, art, public art, commissioned art, glass art, art glass, art lighting, illuminated art, illuminated sculpture, night lighting art, monumental art, cable-stayed sculpture, cable-stayed tower, tower sculpture, art tower, pocket park sculpture tower, civic landmark sculpture, gateway sculpture.